Note: A Unified Threat Management serial is required to use the Reverse proxy service. For more information, contact your Smoothwall representative.  Provides the ability to route multiple HTTP and HTTPS sites to each of their own internal servers.  Increases server efficiency by SSL off-loading.  Improves web server security using intrusion prevention system (IPS). 1. Go to the Services > Proxies > Reverse proxy page. • Choose whether Reverse proxy is Enabled or Disabled. Click Certificate: Choose File to locate your custom certificate. Click Upload. Click Key: Choose File to locate your key file. Click Upload. Tip: The certificate and key you upload must be unencrypted, and password-less. It must also be in PEM format. You can use the XCA certificate and key management client to import and export your SSL certificates and key files to the PEM format. 3. To enable intrusion prevention, and configure a failback address, click Advanced. • Intrusion prevention — The Intrusion Prevention System (IPS) policies stop intrusions such as known and zero-day attacks, undesired access and denial of service. 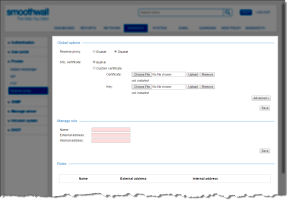 Select Enable to apply an enabled IPS policy. For more information, see Managing the Intrusion System. • Failback internal address — Enter the IP address, for example, 192.168.1.1 or IP address and port, for example, 192.168.1.1:1234, of the web server to fail back to if a request does not match an address already configured. 4. Click Save to save the global options. • Name — Configure a meaningful name for the reverse proxy rule. • External address — Enter the URL, domain or IP address of the site you want to publish using the following format: http://example.com, https://www.example.com/, http://.example.com or http://example.com/path/. You must include http or https in the address. You can also enter a path to the site you want to publish in the URL. When configuring www.example.com and example.com, they are treated as distinct and separate sites, unless you use a wildcard for the domain. To use a wildcard, specify it as: .example.com. • Internal address — Enter the protocol with the IP address or IP address and port of the web server, for example, http://192.168.1.1, https://192.168.1.1, http://192.168.1.1:1234. A port number is optional on the internal address, this enables you to specify custom destination ports for various internal web servers. If no port is specified, the Smoothwall defaults to 80 for HTTP sites and 443 for HTTPS sites. 6. Click Save. The Smoothwall enables and deploys the reverse proxy service and lists it in the Rules area. Repeat the steps above to enable, configure and deploy more rules.